For my latest batches of beer, I decided to make my first attempt at yeast harvesting, mainly to see if I could cut down on the total cost of making beer. I decided to start with a medium sized beer to build up the yeast, then to pitch directly on the yeast cake with a second bigger beer, then to wash the yeast and use it in a cider (so technically 2 beers and a cider). It all turned out pretty well, considering I had a few hiccups along the way. I brewed these starting in early fall and wanted to use a Belgian yeast, so I went with Wyeast #3522 Belgian Ardennes. I started with a recipe I had made before, but as a partial mash, a clone of Surly Cynic, which is a farmhouse ale. I then moved on to a Belgian Dubbel, and then finished off with 3 gallons of cider from a Wisconsin cider mill. The cider was UV pasteurized, so it was just a matter of getting the washed yeast in there and letting it sit for about 4 weeks. It came out quite clear and is pretty tasty. I bottled most of it with some priming sugar, but left a few bottles flat for comparison. 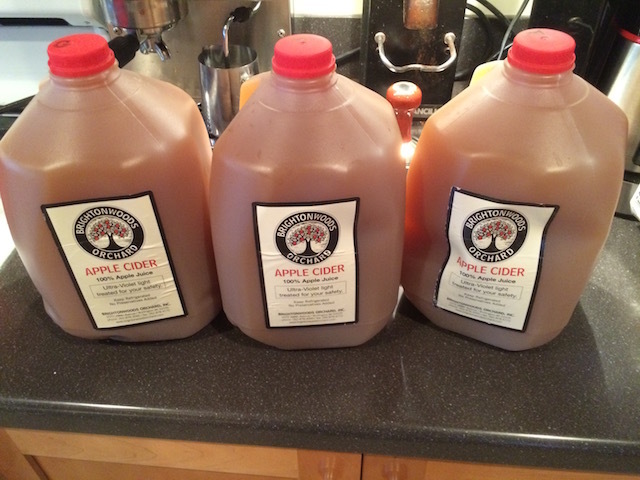 I’ve enjoyed it and want to try another cider soon. The yeast washing did not go as well as planned, there was too much hop residue, but a large amount of yeast had come out the top of the fermenter into my sanitizing solution. I ended up using some of that as well as a little from the fermenter, and the cider fermentation was fairlyactive and worked out ok. Next time I plan to wash yeast I will definitely use a hop bag during the boil. 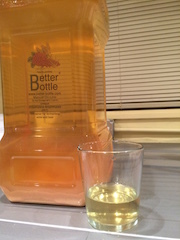 The finished cider, with a glass showing how clear it is. 13.28 quarts of strike water @ 159.73 I ended up having to add more like 16 quarts, and was still at 146. 7 quarts of boiling water at mashout, was at 142 at end of mash. That’s more loss than normal, had to add 9 quarts of boiling to get to 165, so a little cold all around. OG of 11.75 Brix, 1.047. Not good. This has continued to be good, I’m drinking quite a bit of it, giving some away as well. Again, went a few degrees warmer with strike water and it was 149, not 151. I preheated with 1 gallon boiling. Maybe I need to go 5 degrees hotter and add cold if needed. Added 10 quarts of boiling water and ably hit 162 at mash out. Chiller leaked about 1 gallon cold water into wort. OG of 10.5, 1.042. This is going to be ugly. But hydrometer said 1.046, so it might be an OK single. Who knows. Very active fermentation within about 5 hours. Actually blew lots of yeast through the blow off tube up into the sanitizer. Lots of carbonation after 1 week. Decent taste. It does taste like a watered-down dubbel, but still has good flavor. Used 3 gallons of cider, uv pasteurized. Fermented in 3 gallon fermenter, which was too full. Should start in a 5 gallon and transfer. Took about 4 weeks to get to 1.004 and bottled. Very clear. Did 2/3 cup of priming sugar diluted for 2 gallons. Bottled 1 gallon still. Forgot to take OG measurement, but I think it was about 6% ABV. Copyright © 2019 wrighters.net. Powered by WordPress and Stargazer.